General Motors may have abandoned Hummer years ago, but Bob Lutz and his latest project, VLF, want to reignite that fire. 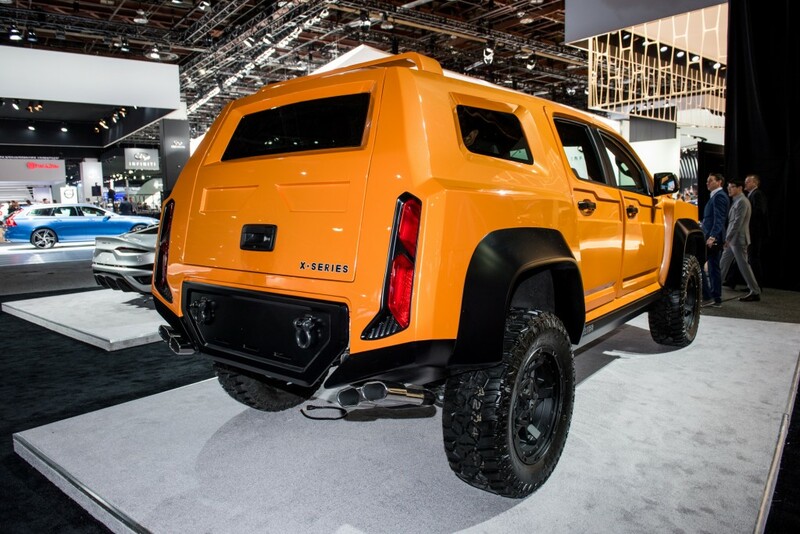 VLF debuted the X-Series off-road vehicle at the 2017 North American International Auto Show, which clearly takes just a wee bit of inspiration from the beloved Hummer H2. The VLF X-Series actually has GM bones, too. Specifically, it’s a 2017 Chevrolet Colorado underneath. However, Henrik Fisker, designer of the X-Series, has imagined all new body panels and a rear canopy. VLF’s business model is to take production vehicles and outfit them with their own unique styling, and occasionally, different powertrains. There’s clearly quite a few parts bin items here, including C7 Corvette taillights flipped vertically. It’s not our cup of tea, but beauty sits in the eye of the beholder, as they say. As for its off-road credentials, the VLF X-Series features 11.5 inches of ground clearance and departure angles of 44.7 and 48 degrees. It also sports a set of 35-inch off-road tires, wrapped around 20-inch aluminum wheels. When it comes to power, the X-Series still features the Colorado’s same 3.6-liter LGZ V6 engine, which pushes 306 hp and 275 lb-ft of torque. The Colorado’s eight-speed automatic is also present. The VLF X-Series isn’t a concept vehicle, though. The automaker plans to begin assembling the vehicle at its Auburn Hills, Michigan plant alongside other VLF vehicles. AAAAAAAAAAAAAND no! Bad Lutz… back in your kennel! Yeah.. well GM needs to get the message that GMC would do quite well with an updated H3 and H3T based off the same pick-up. I agree I just feel like Lutz didn’t do that well with this. I get that he’s trying to prove a point about how easy it would be to fill that gap that all of us GM lovers really want but this seems just… thrown together. I believe that GMC should have filled that segment a LONG time ago. They have the means and they have the know how, it’s just a matter of actually doing it. I hope GM see’s everything Lutz does because he is a true asset to them even though he’s not apart of them any longer. Sometimes I think the old Lutz needs to go back and whip them into shape. What do you think? HURRY UP AND BUILD ME A HUMMER. OR WHATEVER YOU CALL IT. BUILD IT. A hummer replacement literally could not come any sooner.. I want it now. lol. Well the taillights were just slapped onto it… they belong to a corvette… they are just turned on their side that’s all. and the front end is ridiculous I’m sure my 3 year old has drawn this car before. Yeah this is bad. It’s like a spare parts nightmare. A for effort. Note to self: Buy a Destino. This could be a successor of hummer. It’s about time that GM gets back into making Off Road capable Vehicles again! This is definitely different, but so was the H3T and when GM finally put the 5.3 V8 in that is when it took off as a Off Road master…. I really hope they listen to us Off Road guys and start giving us what want….Not what the soccer dad’s and mom’s want!!! Oh and by the way it resembles the front end of a school bus for the record.. When Henrik Fisker first designed a Tesla, they had to scrap that (fugly) design and start over, then sue him for sabotaging their project since he start making his own cars. This might be the same case! Who would approve this hidious thing? I love that chassis and powertrain but the exterior is plain UGLY! Did Henrik designed that hood and grille of a Reaper too? I have owed one of the first H3 in 2006, as well as an alpha 2008 and alpha edition H3 2009 which I still have. Would love another H3. I can not bring myself to a pickup but do wish to have a 4X4. The Tahoe/Escalade as well is not for me. Really do not wish to move from GM so Pleasee hurry and build this thing, looks excellent. First, let me say that I am a diehard GM owner. I currently own and drive my crew cab Silverado Z71 daily and it’s bullet proof (325000 miles later) I also own a H3 (170000 miles) and H1 Hummers. Both great vehicles. The h1 is a military turtleback and is tough as they come. I do agree with the comment the people have made about the ugly aspect of the grille and taillights. If they could redesign those two things, I think they would have a very capable off and on road vehicle with Colorado base. Mr. Lutz please have Henrik Fisker redesign the front/rear so its more off-road capable looking and less slap it together plastic looking after thought. I think, otherwise it would fill the need for a good mpg, tough off-road capable suv that can pickup the kids after soccer practice.